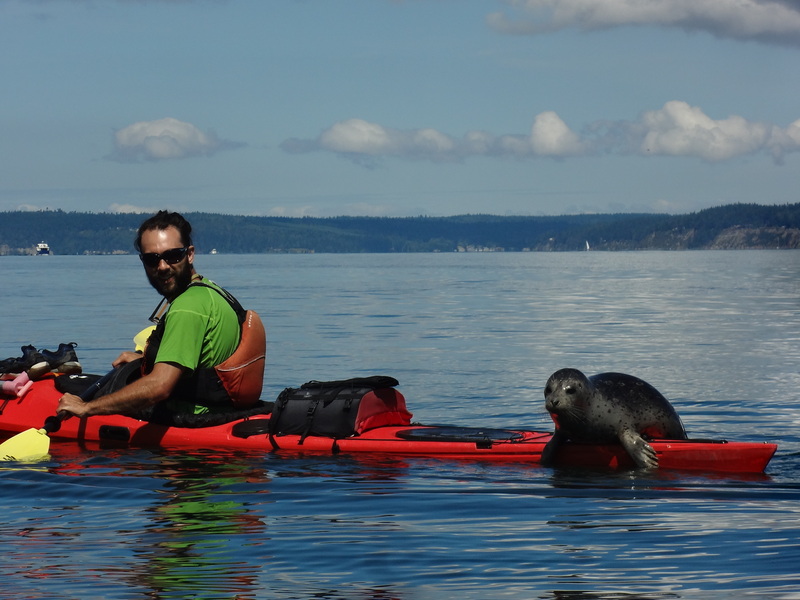 That seal is climbing into our kayak! And so it was. We were touring our guests from out of town around western Washington State and hoped to show them some wildlife, but this was over the top. From the boutique town of Langley on Whidbey Island just 45-minutes north of Seattle we took a 1 ½ hour guided tour with the Whidbey Island Kayak Company. 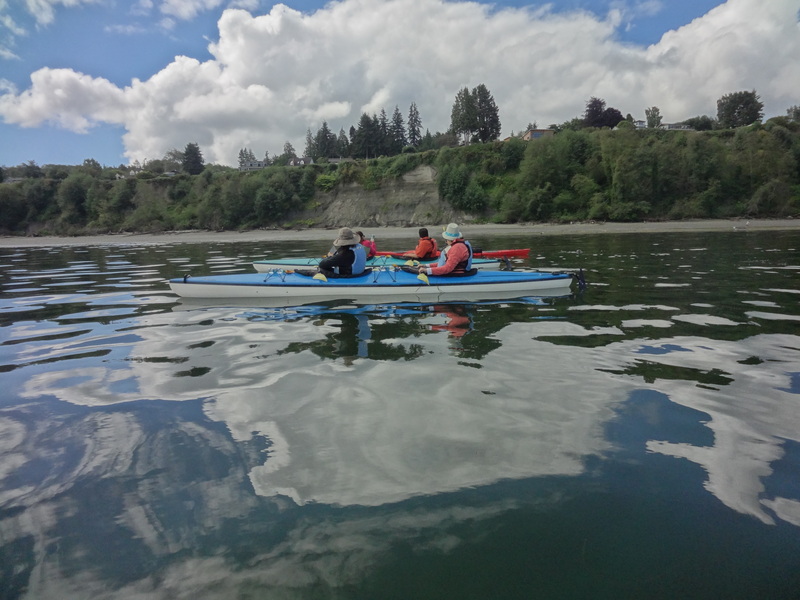 Most of our group had never been in a kayak much less on the big, open water of Saratoga Pass, a mile-wide salt water channel separating Whidbey Island from Camano Island. Whales, sea lions, harbor seals and bald eagles cruise through this area and we were expecting to see at least some eagles, but a harbor seal swimming up to us and crawling out of the water onto our kayaks – no, we weren’t planning on that. After a safety presentation we loaded into our kayaks, three tandem boats with the guide in his own kayak. As we pushed off from the beach at Langley Marina we noticed two harbor seals swimming around about 100 meters off shore. As we arrived in this area a harbor seal pup of about fifty pounds swam up to us close enough to pet (which we didn’t) and began to play around the kayaks, rolling onto his back to expose his white belly and popping out of the water to look at us. Then he swam up to our kayak and jumped up on the front of it using his flippers to pull himself out of the water. But our kayak had a sloping deck and unable to find something to hold onto he slid back into the water. Our guide’s kayak had a flat deck and there our little flippered friend found something he could hold onto and hauled himself out of the water and onto the kayak where he sat, contented, unafraid and enjoyed the view for a few minutes before slipping back into the water. He did this four or five more times apparently enjoying the game until we finally paddled on into deeper water. Young seals typically “haul out” on beaches or rocks to rest and the mothers will leave the pups alone at times to feed in deeper water. Also there were some sailboats anchored nearby and we wondered if they had been feeding the seals. But whether lonely, hungry or simply curious, the young seal liked our group and when not in the kayaks with us would follow us like a puppy when we paddled away. When we returned he was there waiting for us and we played with him for another ½ hour before heading to shore. SEE THE VIDEO IN OUR VIDEOS SECTION. That was great, but where are the whales? Although grey, minke and killer whales (orcas) travel past Langley they had long since either migrated northward or out to deeper waters. So, for whales we traveled to Lime Kiln State Park on San Juan Island, one of the best areas to see whales from the shore. We took the Washington State Ferry from Anacortes through the San Juan Islands on a brilliant sunny day, the glaciers of Mt Baker shining in the background as we cruised through the islands. We arrived at Friday Harbor on San Juan Island and drove to Lime Kiln State Park on the west side. We walked the short trail to the shore where the Olympic Mountains and the southern tip of Vancouver Island were shining across the deep salt water channel of Haro Strait. As we unpacked lunch from our cooler on a picnic table overlooking the rocky shore we watched another harbor seal fishing in the kelp below us. Then, as we ate our ham sandwiches and watermelon we spotted three or more orcas spouting and splashing about a ¼ mile offshore. They soon moved on and we walked along the shore to the old lighthouse there where a log of whale sightings was kept and noticed that orcas and minke whales had been seen here every day for the past two weeks. So far so good, we’d seen seals, whales but no eagles. But wait, . . . on the drive back to Friday Harbor from the state park a big adult was perched in a bare-limbed tree in a farmer’s field not fifty feet from the road. We took our photos as he watched us with his stern eyes and then drove on to catch the next ferry eastbound to Orcas Island where we had a bed and breakfast reserved for the night. Even the ferry landing was rich in wildlife and we noticed the pier pilings were full of nesting cormorants and seagulls with their remarkably ugly chicks begging food just a few feet away from the windows of the ferry. Mission accomplished. 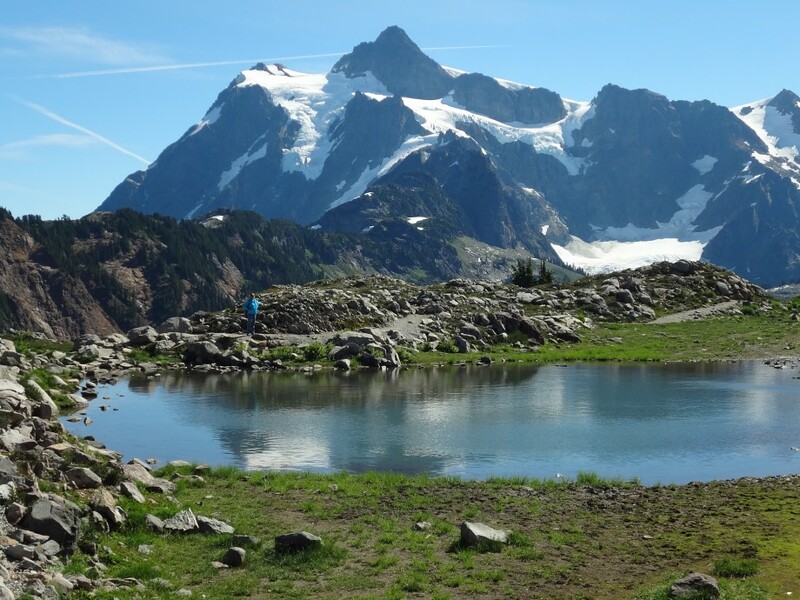 We’d shown our guests some of the most beautiful areas of the Pacific Northwest including the wildlife that lives here, close up and personal at times. Now it’s off to Mt Rainier and who knows, maybe some elk, or mountain goats, a bear even. We’ll see.